It won't happen right away, but many foresee the phasing out of the traditional nuclear stress test. When patients present with chest pain, should they be sent for a nuclear stress test or a coronary CT angiography (CCTA)? The conventional answer is nuclear stress test. "That's why more than 10 million stress tests are being performed in the United States each year," says Armin Arbab-Zadeh, MD, PhD, an associate professor of medicine at the Johns Hopkins University School of Medicine and associate director of cardiac CT at the Johns Hopkins Hospital in Baltimore. But Arbab-Zadeh and a growing number of his colleagues believe there's enough evidence to support changing the paradigm and making CCTA the first test, especially for patients at low to moderate risk of heart disease. It's already happening in Europe, Canada, and a few cardiac centers in the United States such as Minneapolis Heart Institute, Johns Hopkins, and New York Presbyterian, says Jonathon Leipsic, MD, FRCPC, chairman of the department of radiology for Providence Health Care in Vancouver, British Columbia, and president of the Society of Cardiovascular Computed Tomography (SCCT). "Look at Denmark," he says. "The first test someone gets if they present with chest pain is cardiac CT because it is, simply put, the most definitive test, and because, in Denmark, all patients are entered into an outcomes registry." The data that suggest CCTA is an effective strategy are growing "and [are] built upon a wealth of other data including recent large-scale randomized trials," Leipsic says. He expects CCTA will be used with more frequency at more centers to diagnose coronary artery disease (CAD) as managed health care and accountable care organizations continue to grow because it is a very cost-effective and efficient test. However, at most centers in the United States, nuclear stress testing still reigns, and for a number of reasons that are not necessarily evidence-based, a number of radiologists agree. While the evidence in favor of CCTA is mounting, they believe it will take much more data and experience for the change to play out in practice. 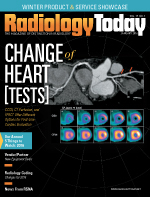 Probably one of the biggest obstacles to making CCTA the go-to test is that it's difficult to change behavior, says Arthur E. Stillman, MD, PhD, FACR, FAHA, chair of the ACR's Committee on Cardiovascular Imaging — Body Imaging and a professor of radiology and imaging sciences at Emory University School of Medicine in Atlanta. "People are trained a certain way. They think a certain way, and they've been successful doing it the way they have for years. It's difficult to get them to change that," he says. Also, Stillman says, many cardiologists have gamma cameras in their offices, but they do not have CT scanners in-house. "So it's easier and more convenient for them to send the patient for a nuclear stress test than it is a CT and the utilization of their equipment comes into play, too," he says. Arbab-Zadeh agrees: "Many practices drive benefit from doing stress tests, while for CT scanning they may have to send the patients away. So there is an economic conflict of interest there." The two tests are comparable in cost—on average between $700 and $1,200, Arbab-Zadeh says. However, reimbursement for nuclear stress testing is much higher, and that's another reason why it is not likely to disappear anytime soon, physicians agree. "If the reimbursement were similar, there would be a large and rapid shift to cardiac CT," says Matthew Budoff, MD, a past president of the SCCT and program director and director of cardiac CT in the cardiology division at Harbor-UCLA Medical Center in Los Angeles. However, Budoff says, reimbursements are at least 2 to 1 in favor of nuclear stress testing, and often 3 to 1 in favor of nuclear stress testing. The higher reimbursement is a remnant of when nuclear stress tests required the isotope thallium, he says. Today, many centers use newer isotopes that have higher energy but less radiation and that don't cost as much and are easier to obtain. Practices can generate the isotopes locally. Yet payers have yet to catch up to the changes in technology, Budoff says. In many cases, they still reimburse nuclear stress testing out of proportion. "Until the reimbursements for CT angiography are increased and the reimbursements for nuclear stress testing are decreased, physicians won't switch because it doesn't pay for them to," he says. Like Leipsic, Budoff expects more balance will come when financial remuneration is not based on doing more tests but on doing more efficient and effective tests. Both radiologists and cardiologists perform CCTA, so Budoff doesn't believe territory or turf is much of the issue here. "I don't think it's based on the type of doctor as much as the availability of equipment, common practice patterns, and reimbursement," he adds. Because nuclear stress testing has a longer history, the procedure has more scientific evidence supporting it than CCTA. Arbab-Zadeh and Budoff both believe that a number of studies have been published in the last few years that should at least begin to sway the pendulum and change practice. The EVINCI Study, a multicenter European study published in March 2015 in the American Heart Association's journal Circulation: Cardiovascular Imaging concluded that CCTA is "more accurate than noninvasive functional testing for detecting significant CAD defined invasively." Three studies also have been published in the United States demonstrating superiority for diagnostic accuracy, Budoff says. Outcomes studies also support CCTA, he says. "They showed you're more likely to be alive if you [got] a CT angiography vs a nuclear stress test. So for heart outcomes, CT has proved superior." The PROMISE Trial, published in the New England Journal of Medicine in April 2015, also compared CCTA and stress testing. It found that CCTA did a better job of excluding invasive and normal catheterizations, and that it had a better indication of when to use aggressive therapies to treat blockages. But it didn't quite hit superiority for outcomes—being dead or alive at the end of the trial, Budoff says. The Scottish-Computed Tomography of the Heart Trial (SCOT-HEART) published in The Lancet in March 2015 also found that CCTA was able to increase the certainty of coronary heart disease in patients with stable chest pain and better enable their physicians to manage the disease compared with those who had standard care. Some don't see the question between CCTA and nuclear stress testing as quite the right one to ask. Thomas Schindler, MD, president of the Cardiovascular Council of SNMMI and director of cardiovascular nuclear medicine at Johns Hopkins University in Baltimore, says that CCTA offers valuable anatomic imaging and is well established to rule out CAD in individuals with low- to intermediate-risk CAD, but when CAD is present with calcifications, perfusion imaging is needed to assess a patient's condition. CT perfusion imaging (CTPI) is the exam comparable to the nuclear stress test. Schindler thinks the newer CTPI exam needs further validation to convince him that practice should change. "Nuclear stress testing is robust and validated. CT perfusion imaging is at the very beginning," Schindler says. "The data [are] interesting and promising but we have to wait and see how robust and accurate this method of testing will prove." Schindler still has a number of concerns about CTPI, including the radiation dose and the number of false positives. Radiation dose with CTPI, although it's likely to come down, can be high, with about 12 to 15 millisieverts (mSv) of exposure, he says. That figure, he says, can be three to four times that of nuclear stress testing with technetium-99. Schindler also believes that false positives with CTPI will send more patients to the catheterization laboratory than necessary. The advantage to the stress testing with a treadmill and nuclear perfusion techniques with normal findings is a long so-called "warranty period" of up to eight years with very low likelihood (below 0.5%) of cardiovascular event, he says. CTPI is performed with pharmacologic stressors. In case of normal perfusion findings with CTPI during pharmacologic stress, the warranty period is only about two years (if comparable to nuclear techniques), he says. "You can discharge patients if you don't see any perfusion defects on their [stress] tests." Nuclear stress testing with treadmill exercise also signifies exercise-related hypertension that also may cause effort-induced chest pain or tightness, a quite common observation among the black population, Schindler says. "You cannot determine that condition with CTPI and pharmacologic stress, of course." Arbab-Zadeh says the key question in the debate is over how the two tests can favorably affect patient management. CCTA clearly shows if the patient has any blockages, even mild ones. Stress testing shows whether the patient has blockages that are severe enough to cause limited blood supply and for to the heart muscle to have symptoms. But even smaller buildup in the coronary arteries can still cause heart attacks, Arbab-Zadeh says. "Other physicians may have different opinions," he says, "but I feel the answer is clear: It's the build-up and not the limited blood supply to the heart muscle that is the main determinant of heart attack risk. I believe the first test in a patient with symptoms suspicious for blockages in the heart arteries should be a cardiac CT because it is much more sensitive than stress testing to detect plaque. If we fail to detect such plaque—as we often will with stress testing—we miss the opportunity to implement therapy that reduces the patient's risk of heart attacks." Arbab-Zadeh also argues that the radiation dose to the patient is overall much lower with CT than nuclear stress testing, as low as 2 to 3 mSv with new equipment in their practices. "In our work, the dose of radiation was half of that of nuclear stress testing," he says. "The caveat is we used contemporary technology, and not everyone in the community is able to use that kind of technology." Still, he says, as long as it is a modern facility with good technology, CT angiography can be done with a very, very low radiation dose. Leipsic agrees CCTA is clearly superior if the goal is to determine whether a patient should undergo invasive angiography or not. Data from the National Cardiovascular Data Registry's CathPCI Registry published by Manesh Patel, MD, and colleagues in the American Heart Journal in June 2014 show that patients going to the cath lab after CCTA are much more likely to have a stenosis than if they have a stress test prior to catheterization, Leipsic says. Both sides agree that CCTA works best for patients believed at low risk of CAD. It is not recommended for those with known CAD, especially those who had bypass or stents, and for those aged 80 or older who almost certainly have CAD, Leipsic says. In higher probability patients who have more classic angina, nuclear stress testing performs better, Budoff says. "Nuclear stress testing tells us which vessel is involved so we know which to go after if we want to do cardiac cath and stenting," he says. The more recent addition of fractional flow reserve (FFR) calculations to CT (together abbreviated as FFRCT) boosts its accuracy and might make it a much better test than invasive angiography for patients with suspected CAD, Leipsic says. The PLATFORM study, presented at the 2015 European Society of Cardiology in London and published concurrently in the European Heart Journal in September 2015, found that FFRCT can reduce invasive heart studies. Nearly 600 patients were imaged at 11 European centers using FFRCT (HeartFlow). Almost three-fourths of the patients who were scheduled to undergo invasive angiography were found not to have significant blockages. In 61% of the cases, the angiography was canceled after receiving the FFRCT results. Many sense that the change is coming but are just not sure when. "Predicting the future is a tough thing," Leipsic says. "It could be as little as three or four years until the paradigm begins to shift at most centers in the United States, with most patients with suspected CAD finding that they are headed for CCTA rather than a traditional noninvasive ischemia test." It may take longer as changing practice guidelines take time, Arbab-Zadeh says. "It could be five years; it could be more," he says. "It's coming. Just how soon is unclear." In the meantime, it is left to individual physicians to decide how to interpret current evidence, Arbab-Zadeh says. "I can honestly say that in most instances, I would choose a cardiac CT over a stress test if it was a family member or myself who was in need of testing for blockages in the heart arteries." — Beth W. Orenstein is a freelance writer based in Northampton, Pennsylvania. She is a frequent contributor to Radiology Today.